Bono, who has been a vocal advocate for issues including the eradication of extreme poverty, demonstrate the power in the metaphor of a bridge recently in Turkey. See the link here. 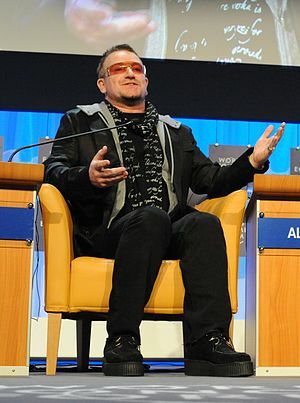 You have to hand it to Bono- he gets around…in the photo in this blog he is featured at the 2008 World Economic Forum. Kudos! Should we care about what anyone else thinks about global poverty, and is it right to give a louder voice to the rock-stars who step up to the microphone to advance this issue? Bono, Jackman, Jolie, now even Madonna! This entry was posted in Bono, Hugh Jackman, Rock star and tagged Bono, Hugh Jackman, Poverty.